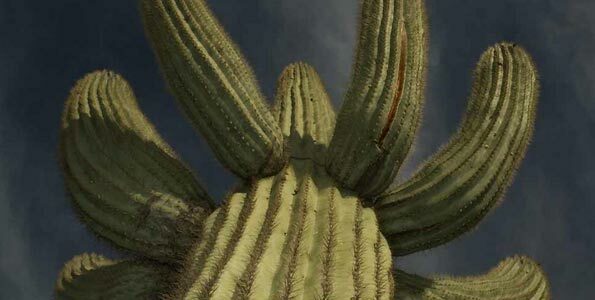 When you hear the word “saguaro” you probably imagine a large, tree-sized cactus with a mighty ribbed stalk that grows in the Caribbee coastwise. I also once thought that all representatives of this species are too big and don’t suit to be houseplants. But once I visited a flower-show and was enchanted by a small odd bluish plant with wax film on it. It turned out to be Cereus peruvianus “Monstrosus”, a typical saguaro cactus. Since that saguaros are honorary members of my collection.The genus name means in Latin “wax candle”. 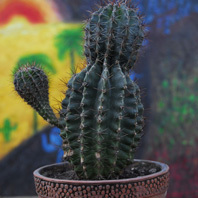 Saguarosare called this way not only owing to the columnar stalk, but also because of the wax film covering young bluish sprouts, that stiffen later. Pretty white or pink flowers with puce edges, that blossom out in the night, stand out against the background of this aquamarine ribbed stalk. 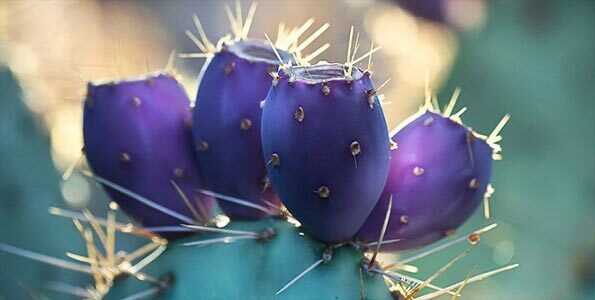 Edible fruits are juicy and sweet.There are just a few saguaro species widespread as indoor plants and they all are well-liked among collectors for their unusual beauty and simple tastes. These cacti don’t need special care but still you have to observe the rules that are common for all xerophilous to achieve their healthy development and flowering. Saguaro cactus requires much sun in all seasons. 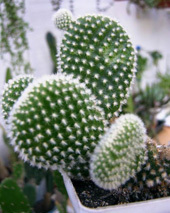 I keep myÂ plant in the strong sun without any harm for them, but it is necessary to take into account that in spring you should accustom your cacti to sun gradually to avoid burns. Young exemplars need shading as well. In summer I expose the pots to the light and sprinkle the stalks in the evening with hot water to wash away dust. But if you have no possibility to give your plant enough light, you shouldn’t be sad because saguaro cactus can grow in the lamplight. 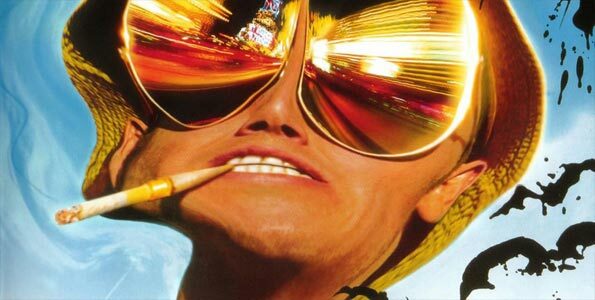 Fresh air is also necessary for all the species, so I try to air the room as often as possible. Usually saguaros don’t give a lot of troubles and grow quickly. 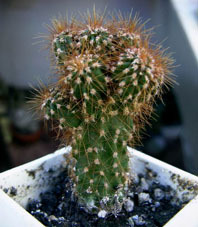 Another condition you should consider to keep your cactus plant healthy is the proper amount of water. In spring and summer I water my plants gently – the soil must be sufficiently moist. In autumn watering is to be reduced and in wintertime don’t water it at all, except when the pot stands in a warm place: you can water it a little once a week. And here comes another question: does saguaro cactus require warmth all year long? If you’ve already looked into the section True and False about Cactus, you should know that like all xerophilous it needs a period of rest. 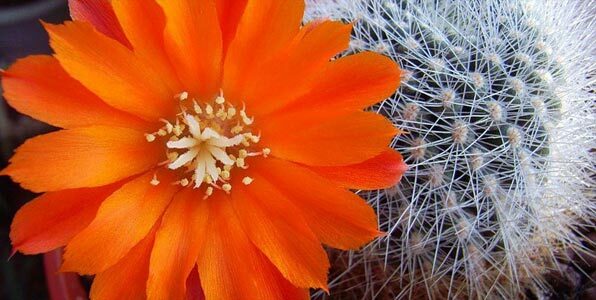 At this time the year growth ripens and a cactus musters its strength to vegetate well in spring. I made sure from my own bitter experience that in winter saguaros must be kept dry and cold – about 10-15C. Earlier my plants stood on the windowpane just above the central heater. The soil became dry fast and I watered them from time to time, fearing that my little friends would perish. It wasn’t very dangerous for cacti but they didn’t grow properly and didn’t bloom at all. When I found out that a period of winter rest is urgent for saguaros, I’ve built special glass shelves to protect my cactus plants from heat emanating from radiator. Now I admire beautiful cream-coloured flowers opening at night every year. Soil is also of no small importance. Not everyone knows that saguaro cactus can’t bear alkaline soil at all. They prefer acidic soil. My recipe is: turf soil, leaf mold, garden loam, coarse sand (2:2:1:2) mixed with slack lime, broken brick and charcoal. I transplant my young plants every year, grown-up ones – in 2-3 years. Saguaros grow quickly, that’s why they need not only a rich watering, but also an additional fertilizing in the period of their rapid vegetation (end of spring – middle of summer). 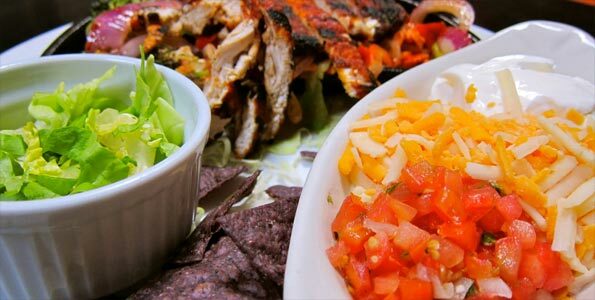 I usually buy cactus fertilizers in the shop, there are some good ones on the market.